A suitable comic for students studying perseverance, resilience, and symbols of strength in comics. A series of very close shots build tension in the early pages. The Riddler’s exotic and toxic green colours dominate this comic. Black pages also appear, which are important to Bruce Wayne’s backstory. Scenes in this comic relies on very close shots at dramatic points to punctuate the story arc. Particularly when the ending approaches. This restricts what the reader can see, and adds to the tension. It is not until the end of the comic that the comic pages allow the artwork to flow widely across the page. Green dominates the comic book. It’s the Riddler’s influence. Early on in the story, the Riddler plays a game with Batman. The colour of his green suit seems to flood the panels, saturating the air with neon green light, and even warping the colour of his eyes. Scenes where Commissioner Gordon stands outside in the bright afternoon sunlight contrast with their variety of colours. It’s also worth noting the blackout. Two pages of the story are blacked out. They only have a small amount of dialog. They tie into Bruce Wayne’s backstory, which sets up the comic’s values. Without his guardians – Commissioner Gordon, Lucius Fox, and Alfred – the Batman would be unable to confront the Riddler. In a long speech delivered close to the finale, Bruce Wayne comments that zero represents nothingness. All throughout his conflict with Edward Nygma – The Green Suited Riddler – The double meanings of seemingly everyday and ordinary objects, names, and places has become clear many times. Through Bruce’s complete backstory, the value of zero becomes more clear. Lucius Fox and Commissioner James Gordon are heroic, and Alfred is a lifesaver to the Batman. There is no way that any of the Riddler’s plans could be foiled without these three men supporting Bruce. They are his guardians, and have a lot to teach him. The comic values facing pain, rather than becoming numb to the world. Zero year becomes a symbol of the battle for identity and personal strength against pain. Batman becomes a symbol of strength. A major secret in Batman’s past is revealed. The pain he went through after the murder of his parents reached a point so intense, he voluntarily sought electroshock therapy. His plan was to be rebooted. Like an appliance, the brain runs on electricity. Bruce almost went through with the therapy to reboot himself. To delete himself, and the pain as well. He decided to remain Bruce Wayne at the last moment, and find the reason to keep fighting and living. Before he could articulate what he wanted, Bruce states he knew he needed something important: he called it the “crazy thing that keeps me from going crazy”. Many years later, the Batman arrived. This is a story about identity, and symbols. The Riddler’s attempt to deprive Gotham city of light and technology – resetting it back to zero – is defeat. Batman’s fight across zero year symbolises the fight for identity and personal strength against giving up, and defeat, in the face of pain. The Batman became Bruce Wayne’s reason to keep going – a symbol of strength he could use to protect Gotham City. It’s a fitting anniversary story to celebrate 75 years of Batman comics. Batman #33 is published by DC Comics ($4.99 USD). Scott Snyder (W.) Greg Capullo (P.) Danny Miki (I.) FCO Plascencia (C.) Dezi Sienty (L.) Cover artwork by Capullo, Miki, and Plascencia. A great comic for high school students studying heroes, and super hero, with a roundup of qualities such as self respect, courage, strength, honesty, and compassion. A useful comic for classes looking at religion and the role of faith in comics. Ms. Marvel has the ability to shapeshift – her fists grow, and she can morph into big objects: a couch for example. Deep in a gloomy and dreadful sewer, She fights a giant Alligator. Kamala Khan disguises herself as a couch. Her face appears in the arm rest. Shapeshifting powers depicted here are clever. Kamala can shrink and grow, and also take shapes that allow her to blend in. Her main use of her talents is growing giant fists. The concepts depicted in the art make the comic light and funny despite the darker settings – Kamala tracks a villain into the sewers. Kamala calls out “Power Attack” before she strikes out at shadow in the dark tunnels. The lettering is big, red, and punchy at this moment. The artwork also refreshes a classic urban legend: In the sewers hide giant alligators. The giant green reptiles rise out of blue water. Kamala’s conversation with Sheik Abdullah fills the core of the book with meaning. Instead of a heavy lecture, Sheik Abdullah listens to her, and gives her meaningful advice to help take the tension within her family down a notch. Kamala’s has no problem smashing an exploding robot, but a summoning to see the Sheik Abdullah – head of her local Mosque – has her running scared. It’s true to life: being called before some community elder of any kind is a scary prospect. In Wolverine, Kamala finds some common ground. At least, Kamala claims they have common ground, when she loudly tells Wolverine she’s a fan, and that they are “twinsies”. Despite the first impression, Wolverine starts to show her some wisdom of a different kind – information about fighting, and mutation. One of the characteristics of a Super Hero story is that a hero can inspire the cast around them, and the readers, to be better – to live up to big qualities and be the best version of themselves. It’s likely Ms. Marvel will begin inspiring those around her. It’s good wisdom for a superhero comic. One of the facets of the Super hero stories is that the central hero acts as catalyst – inspiring people to be better. To be the best version of themselves they can. It’s great to see a Ms. Marvel, which is a relatively new Marvel comic, tell a story about a young hero attempting to live up to these qualities. It’s likely Kamala will act as a catalyst, and begin inspiring both the cast surrounding her and readers. Two popular culture references. When meeting Wolverine, Kamala describes him using the Doge Meme, saying: wow, such athletic, very claws, so amaze! Broadly speaking, Ms.Marvel’s abilities resemble those used by Pirate Captain Straw Hat Luffy from the One Piece anime and manga series. 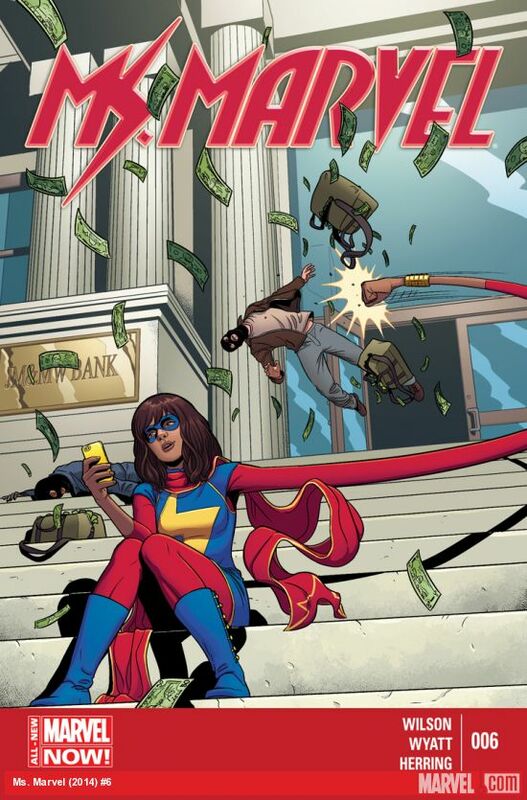 Ms.Marvel#6 is published by Marvel Comics. ($2.99 USD). G. Willow Wilson (W.) Jacob Wyatt (A.) Ian Herring (C.) VC’s Joe Caramagna (L.) Cover Artwork by Jamie McKelvie and Matthew Wilson. 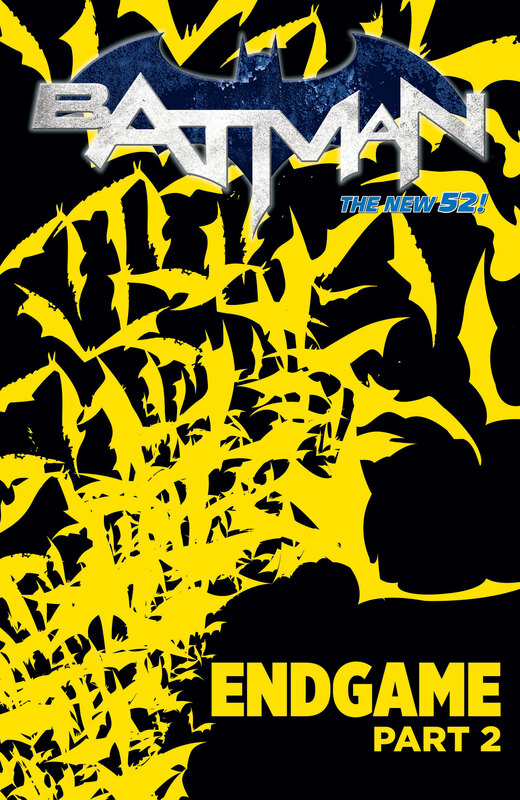 Batman #27 is a part of a large story: an episode of the current Batman story arc called “Zero Year”. The comic book itself divides its pages between retelling the Batman’s origins, and introducing more perspectives on The Batman from characters such as Alfred, Commissioner Gordon, Barbara Gordon, and the Riddler. These are valuable points of view. Particularly Alfred’s ideas. Apart from a reflection on heroic symbols and their meaning, the comic entertains and continues a good story about The Batman. It’s a good comic for readers who are Batman fans or enjoy horror and crime, and superhero style stories. The comic entertains. It has moments that are profound. Panels useful for older students appear. Teachers might draw on some of these for teaching vengeance and justice themes. Mostly, Batman #27 entertains though. This is not a flaw – the comic book entertains with a great story, cryptic riddles, and Batman references. The moment that Barbara Gordon – Batgirl – first saw the Dark Knight appears in this issue. The Riddler threatens rather than jokes. Here he’s a mastermind. One step ahead of the The Batman, The Riddler executes his plans without wasting time. His character behaves like Ozymandias from Watchmen. There’s a sense of frustration – if only The Batman could find him, and stop this man in green and purple skyping insults and riddles. Jim Gordon reflects on his early career in Gotham. Hounded by more experienced officers and mistreated. Ignored and shunned for being an honest cop in a room full of men up to the neck in bribes. He reflects on the ordeal the senior staff inflicted on him. Inside is a sequence of panels where Gotham’s streets bathe in sepia light.Later, The Batman sits on a wire in the rain. Behind him there is lightning. He’s a shadow. It’s a thrill to see this reference to The Dark Knight Returns. At one point, The Batman is on the run from the police. The colours are toxic, and painful to look at. It’s not until Jim Gordon arrives to pull the Batman from Gotham river’s black water that the colours lose their toxic shades. They change to sombre tones of purple and orange. The water changes grey. What’s reinforced by this chameleon-like shift from harsh to warm colour is that The Batman can trust Jim Gordon. Then Alfred reflects on his own experience with the Batman. He raises a great discussion about the power of symbols, and about the value of justice, hope, and inspiration over scars, darkness, and revenge. He tell Bruce Wayne that in his experience, symbols of punishment and rage don’t last. The Batman needs to more than just punishment. Instead, Alfred cautions Bruce that everyone can see what he is doing. Some of those watching want to help. He needs to recognise this, and to understand that a symbol – a heroic symbol – inspires the best in people and lasts. It does not fall apart at the seams. It does not wither away and decay. I began this review stating the comic entertains the reader, and has only a few moments where themes of revenge and justice are discussed. After re-reading the comic book, a deeper meaning might be nested inside a story that entertains on the surface. Reading a single issue, however, does not give enough detail in this case. Reading all of the “Zero year” issues, either as single comic books or collected into a graphic novel, will give a big-picture perspective. More meaning might emerge. For example, there is the yellow moon references laced through Batman #27. On the next page, Batman is caught in a spotlight the same colour and shape as the yellow moon on the previous page. Towards the end of the comic, Batman picks up a yellow, military helmet with “Tokyo Moon” printed on it. If there is a pattern to these cryptic clues, I can’t see it yet. If anyone has a theory or idea, please leave a comment. With some reference to real world discrimination, All New X-men #21 shows off captivating art while telling a story about minorities and religion. 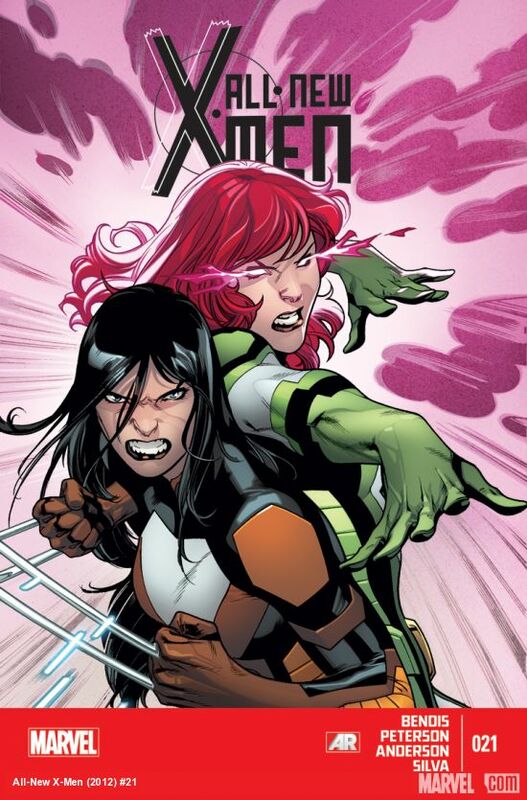 Jean Grey and X-23 are the two Marvel super heroes featured on the cover. The pair play a larger role in the plot compared to the other X-men. Kitty Pride also plays a key role. It’s the strong antagonists of the comic that drive the action forward. William Stryker’s son intimidates and evangelises with his mutant-hating “purifiers”. These characters are Christian Fundamentalists – the Bible is literal to them, and they are critical of liberal values. Purifiers revile mutants. That’s the narrative thrust of the story, and the source of conflict and themes. A minority group battles against influential, and well armed, fundamentalists. Who is William Stryker? An evangelical entertainer and former solider, Stryker led a public, religious campaign depicting mutants as evil. This story arc appeared in the graphic novel God Loves, Man Kills (Marvel comics, 1982). In a Flashback scene, William Stryker appears, and gives a speech to a sold out music hall. It’s a link back to the Marvel graphic novel where he first appeared. William Stryker, decades ago, influenced the opinions of millions with his fervent bible readings. He quotes from the book of Revelation. Without including spoilers, the artwork captures a sense of sound and volume. Looking at the art, you can hear Stryker’s voice over the public address system, shaking the room. The audience rumbles, roaring with applause, introducing energy to the art. of illness. With the glasses missing, however, the revulsion the scientist expresses when William Stryker places a hand on his shoulder and utters “Let us pray” cuts deeper. X-23 recently arrived in All New X-men #21 from a now concluded series called Avengers Arena. One of the themes of the Arena comic was the impact of reality television, with a Popular Culture reference to the Hunger Games. All New X-men summarises this theme: Stryker’s son states: “You were on a reality show. You were popcorn for morons”. Reality television is derided here, which aligns with themes brought up by Avengers Arena, and Hunger Games themes. The larger themes brought out are religion, fundamentalism, and discrimination. Discord between religious and scientific women and men feature to some extent. Early in the issue, a doctor says to Stryker Senior: “Quite a show business machine you’ve build yourself” implying the Stryker is using faith and religion to sell support for his anti-minority cause, manipulating his audience. The man (a scientist) shrinks away when Styker asks him to pray. When confronted with the possibility of killing the X-men, one of the Purifiers stops Stryker’s son acting, and asks: “Is there someone we could talk to about this? Someone smarter than us?” This depicts the purifiers are fearful, lacking in conviction and intelligence. Later, another scientist remarks to Stryker’s son “We sell you our best weapons, and you do what you think you need to do.” The scientist, who works for the organisation called AIM (mentioned in Iron Man 3), clearly has little respect for Stryker’s beliefs (A small clash between science and religion). All three quotes demonstrate the argument against fundamentalist religion. It’s an argument X-men comics are known for. The purifiers are unintelligent, manipulative, carry weapons, and “do what they think they need to do” rather than carrying out a legitimate belief. Fundamental and “pure” approaches to religion are a problem: that’s the key ethic of the comic. The X-men are a minority targeted and discriminated against by hateful and manipulative religious groups. They fight back, and the comic captures the push against discrimination. All New X-men #21 is published by Marvel Comics. ($3.99 USD). Brian Michael Bendis (W.) Brandon Peterson (A.) Israel Silva (C.A.) Brent Anderson, with James Campbell (A.) Cory Petit (L.) Cover Artwork by Brandon Peterson. Black Bat is not a copy of any other super hero currently in Popular Culture. Created in the 1930’s (1933 – 1936), Black Bat pre-dates Bat themed and black cloaked super heroes. That’s one unique feature Dynamite offers by publishing Black Bat – new stories starring the earliest super heroes from the beginnings popular culture. When Tony, the Black Bat, speaks to Carol – the administrator and security officer keeping Black Bat alive – they talk about the consequences of letting a career criminal live. It’s in these moments that silence is used effectively. Space in the panel’s artwork also shows the disconnection between these characters. Oliver Snate is under arrest, and in hospital after Black Bat’s assault on him. Carol and Black Bat grappled with a decision – kill Snate, or let him live to face the law. Colours flare up in the comic when dramatic moments appear in panels. A young man in a suit attacks an old man in a sports jacket – the panel changes from cold grey to bright, warning orange when the first punch is thrown. Selectively using colour to tell a story otherwise depicted in muted tones of green and grey is an effective choice, and makes some panels punchier than others. Green, a colour that some detergents and cleaning products use, turns up in washes of green light across all the panels set in the hospital. This colour choice creates an antiseptic, sterile tone. It’s another example colour used effectively in comics and graphic novels. Look out for several popular culture references that turn up, hidden in plain sight. Jules and Vincent from Quentin Tarrantino’s Pulp Fiction make an appearance. Later, a police commissioner resembles the clean-shaven Walter White from Breaking Bad. Keep an eye on the sequences of panels when the art spreads across two pages. Theses scenes are excellent examples of sequential art. The key theme of redemption plays out in these pages. Oliver Snate and Black Bat have a history. The bat could have killed Snate and take revenge. He wants redemption for everything he’s done in his past life, however. Revenge and murder – crime – don’t fit the Black Bat, or Tony Quinn’s new identity. Close to the end of the comic, Black Bat heads out at night to attack a crime family. He says they are ruining what was once a proud neighbourhood. Crashing into a bar, Black Bat demolishes the families security. What he find when he breaks into the back room is not what he expected. Black Bat has broken into a funeral. It’s a humanising moment for characters that Black Bat himself referred to as “Bad Guys” just one scene earlier. “Bad guys” have families too. Black Bat reflects on the difficulty of redemption. Changing from the man he used into something more turns out to be a far more difficult and complex path to walk then he expected. It’s a good thing to read a comic that candidly shows the difficulty in making changes for the better. That’s the key ethic here – redemption is a hard path to walk. 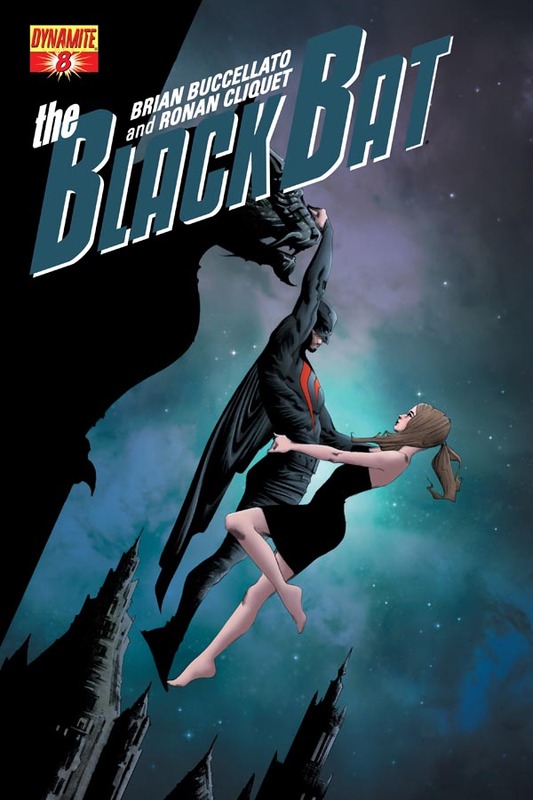 Black Bat #8 is published by Dynamite comics. ($3.99 USD). Brian Buccellato (W.) Ronan Cliquet (A.) Mat Lopes (C.) Rob Steen (L.) Cover artwork by Jae Lee.